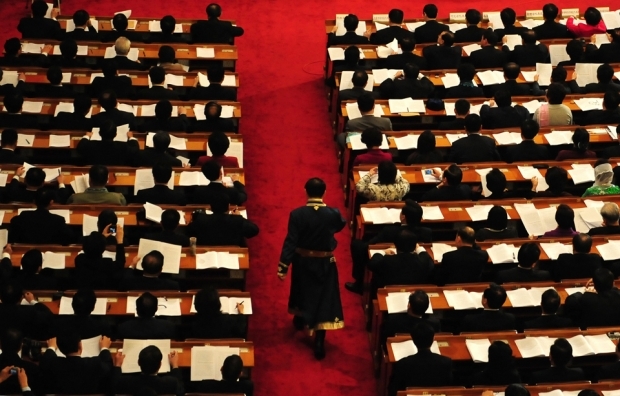 A delegate returns to take his seat during the opening session of the National People's Congress at the Great Hall of the People. This article was first published in the June 7, 2012 issue of The New York Review of Books. Roughly every decade, China’s political system cracks, its veil is rent, and its inner workings are laid bare. 2012, the Year of the Dragon, is turning out to be one of those periods when the country’s high priests can’t quite carry out their rituals as planned. On the surface, the problem is simple: these top leaders discovered in February that they had a murderer in their midst. That person was Bo Xilai, a former Politburo member and Party secretary of Chongqing, whose wife, the lawyer Gu Kailai, is accused of being responsible for the killing of an Englishman, the financial consultant Neil Heywood, who was rumored, without evidence, to have helped the Bo family and others to send money out of China. He died on November 14, and it has been speculated that he had gone to Chongqing to celebrate Gu’s birthday on the following day. Just why and how he died remains a mystery, but according to the still-sketchy story,2 Bo helped his wife cover up Heywood’s murder, making him an accomplice. Some of the official story was reassuringly familiar: Bo is a bad apple, the kind of person that every political system in the world can produce—a politician who misused his office to save a family member from the law. But this version has one major hole: Bo’s misdeeds only came out after his police chief, Wang Lijun, fled to a US consulate in February and told American diplomats that Bo had done something seriously wrong—in other words, it’s not as if the Party figured this out on its own. But once the story was out, the Party quickly removed Bo and admitted he’d engaged in bad behavior. Bo and his wife face prosecution in connection with the murder and will be punished in accordance with the law. End of story. And yet it’s a narrative that few Chinese believe is so simple. Bo represented the Party’s left wing, which is skeptical of some of China’s reforms and wants vigorous action to counter the enormous, growing gap between rich and poor. Xi Jinping, by contrast, represents middle-of-the-road reformers who acknowledge that problems exist but offer vague, gradual solutions. Extremely ambitious, Bo was already in the Party’s twenty-five-member Politburo and aspired to join Xi in its even more exclusive nine-member Standing Committee, which effectively rules China. Given his seniority, his influence among military leaders, and his telegenic populist appeal, he would have been a formidable voice in Xi’s new government, even if he hadn’t gotten onto the Standing Committee. His promise as a politician led some leaders, according to credible reports, to oppose his outright purge, arguing that he should have been given a face-saving retirement or ceremonial post. These concerns explain why the Party’s main propaganda organs have been apoplectically insisting that all is well. For much of April, the front pages of the Party’s flagship People’s Daily were replete with accounts of the activities of each of the Standing Committee’s nine members. The reports seemed to be saying: see, we’re all here, all working together, and nothing is wrong. These articles have been supplemented by editorials urging Party members and military officials to be loyal to the state. The drumbeat has been so repetitive as to appear desperate—as if perhaps some in the Party aren’t listening. Naturally, Chinese with any experience reading Party newspapers pick up on these signals and can only come to one conclusion: that the Party is disunited over Bo’s ouster and faces its biggest test in years. One shouldn’t exaggerate the depth of the problem. Some have called this the biggest political crisis in China since the 1989 massacre of pro-democracy protesters. Technically, that might be accurate but it’s a bit like comparing this afternoon’s shower with last year’s typhoon. Back in 1989, thousands of protesters controlled the heart of Beijing, the army removed them with violence, and the Party’s general secretary was deposed. China was isolated and its entire reform program put on hold. This year’s turmoil is far milder. Xi is still on schedule to take over from Hu, and China’s policies appear unchanged. But today’s China is also a far different place from the relatively poor, rural country of 1989, just over a decade removed from the Cultural Revolution. Back then, reformers relatively easily reestablished the Party’s legitimacy by reviving reforms and allowing the country to embark on an amazing twenty-year boom that lifted tens of millions out of poverty, created a middle class, and urbanized the country—late last year, for the first time in Chinese history, more people lived in cities than the countryside. These changes, however, have brought new actors and new demands. People such as the blind lawyer Chen Guangcheng represent a new class of Chinese who want the law to apply to all equally and are willing to challenge abusive local officials. The Party recognizes the need for the rule of law and this is why central authorities had a hard time condoning his illegal detention by local officials in Shandong province—and why the government has been in a state of confusion over whether Chen should be given a degree of freedom in China or allowed to go to the US. For this growing number of politically conscious people, the arguments used against Bo appear questionable. Besides the more formal allegation of accessory to murder, Bo has also been criticized for corruption, trampling on civil rights to fight corruption, and glorifying the Cultural Revolution by reviving public singing of “red songs”—an attempt to restore the lost camaraderie and morale in Chinese society. Critics of the current campaign against Bo concede that these points are valid but make a broader and more damaging argument: Bo is the rule, not the exception. Almost all of China’s top leaders have immensely rich family members; by these standards, the Bo clan hardly stands out. As for civil liberties, in late April the government’s chief law enforcement official flatly stated that the law must serve the Party’s needs. And while red songs might appear crude, the Party’s answer is hardly better: it recently launched a national campaign to revive morale by resurrecting Lei Feng, a soldier who died when hit by a truck in 1962 and was made a Communist hero of selflessness, an implausible figure widely mocked as a creation of Party propagandists. Discussing these issues in public, however, is impossible. The Party has blocked many key search terms on social media sites and banned competing accounts. In late April, the Party’s Xinhua news agency even launched an attack on foreign media for reporting rumors about Bo, as if lèse-majesté was a crime enforceable beyond China’s borders. To be fair, some of these foreign reports have been absurdly speculative. Articles have appeared recounting private conversations between Bo and Wang, with no explanation about how they are known. Others have suggested that Heywood was linked to Western intelligence agencies, although this was quietly dropped when it was found out that his car license plates included the numbers “007”—perhaps not exactly in keeping with his supposed MI6 connections. The Party, however, hasn’t offered facts to back its own version of events. To date, no one has even presented evidence that Heywood was murdered. Since he was cremated shortly after his death, an autopsy appears to be out of the question, unless one was secretly conducted beforehand and soon will be revealed. As for confessions and eyewitnesses, the prevalence of torture and pressure in China’s criminal justice system means that such evidence will have to be treated cautiously. Even if we assume that Heywood was murdered, it’s still hard to understand Bo’s role. One widespread claim is that he obstructed an investigation into Heywood’s death and perhaps even had police officers tortured to hush it up. The theory is that these efforts led to a split between Bo and Wang, leading Wang to flee to the US consulate in Chengdu and tell the world about Heywood’s death. Yet this has not been supported by any facts. It’s also not clear why Bo and Wang would have feuded over Heywood’s death. By all accounts, Wang had willingly been Bo’s hatchet man in Chongqing for years—having criminal bosses and their government patrons arrested, tried in kangaroo courts, and executed. So why the fit of conscience? China’s police force is a tool of the Party, so it’s hard to imagine a Serpico-type cop standing up against the corruption, determined to find Heywood’s murderer. This story about Wang as an upright policeman has been pushed by his associates, such as the Chongqing intellectual Wang Kang, who also claims almost psychic knowledge of Gu and Heywood’s states of mind. But such claims should be treated skeptically until there is some clear evidence. Of course, one can come up with other explanations. One making the rounds is that inquisitors from the Party’s powerful Central Commission of Discipline Inspection were already in Chongqing last year sniffing around hoping to find evidence to do in Bo before this year’s handover. They got word of Heywood’s death and started to pressure police chief Wang for information. Wang then went to Bo, realized that his boss was going to sacrifice him by saying he was involved in Heywood’s death, and fled to the consulate. Another possibility is that the investigators were on to Wang for his own corruption, with the same results. Or they were investigating Wang and Bo for wiretapping senior leaders who had been visiting Chongqing, and so on.3 Or perhaps investigators simply were there on a routine inspection trip. The theories abound, all united by a commonsensical understanding that the murder—if it was a murder—isn’t the whole story. The Chinese media aimed at foreigners—the newspapers China Daily and Global Times, as well as the English-language version of the Xinhua news agency—have snorted at all of these theories, saying they are unsubstantiated rumors spread by enemies of China. The case is clear, they say: Bo was involved in a murder and must go. Clearly Bo was a loose cannon and in any system probably would have self-destructed before he reached the top. But he did stand for something. Right now, China is about to get a new leadership team without anyone having much of an idea of what it stands for. People assume Xi is pro-reform because he led two economically liberal coastal provinces, Fujian and Zhejiang, but his main achievements seem to have been to have avoided serious scandals and not to have made too many enemies. He later held a series of inner-Party postings, especially one that made him responsible for Party personnel matters. That’s given him enormous influence inside the Party, allowing him to rise swiftly and surely without red songs and gang-smashing police chiefs. This sort of résumé—quietly following the Party line and building up a power base in the Party—is clearly the way to the top in a one-party state. But it leaves many Chinese without any clear sense of what is to come, except more of the same.